Earlier this year, Iowan Maddie Poppe won “American Idol,” and now the state of Iowa can be proud of another rising star claiming a national singing competition title. 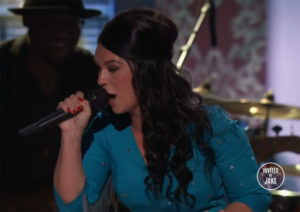 Jaida Dreyer, a Canadian-born, American-raised singer won Wednesday night’s finale of “Real Country” on the USA Network. Her original performance of “Jack it to Jesus, Spray it to Hell” was good enough to win Season 1 of the show earning a score of 4.6 out of 5 from the fan vote. Dreyer, who spent the first 12 years of her life in Latimer, was one of seven finalists vying for the top title on the show. She wins $100,000, a performance at the legendary Grand Ole Opry and at next year’s Stagecoach Music Festival in California. The show featured mentors Shania Twain, Jake Owen, and Travis Tritt.